Located off the coast of Queensland, Australia's world heritage listed Great Barrier Reef is one of the seven wonders of the natural world and host to the world’s most diverse marine ecosystem and its largest coral ecosystem. Despite being exposed to the highly damaging ultraviolet (UV) radiation of the Australian climate for extended periods of time, the shallow water corals of the Great Barrier Reef appear to be able to thrive under conditions of extended solar irradiation. It has been known for some time that coral extracts contain one or more UV absorbing substances , but their identity and mechanism of action was, until recently, a mystery. 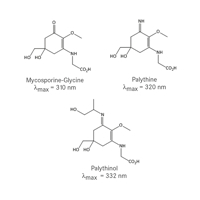 Research from scientists at the Australian Institute of Marine Science (AIMS) helped to solve this puzzle with the identification of a family of mycosporine-like amino acids (MAAs) as being present in the corals[2,3]. These compounds are thought to be secondary metabolites produced by the algae which live in symbiosis with the corals of the Great Barrier Reef. They possess the ability to absorb light and examples of these compounds which absorb ultraviolet light have been isolated. The identification of the role of the MAAs as nature’s sunscreen has been further reinforced by experimental observations of a correlation between UV exposure and levels of MAAs present. 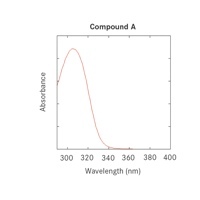 The structure of some representative examples, along with their absorbance maxima can be seen in figure 1. Australia’s harsh climate is well known for the damage it can do to skin – the country possesses the highest per capita incidence of skin cancer in the world, with approximately two out of every three Australians being diagnosed with skin cancer by the age of 70. For photoprotection, application of broad spectrum, water resistant, SPF30+ sunscreen is recommended along with other measures such as sun-protective clothing. Skin cancer is caused by skin damage due to acute and long term exposure to certain parts of solar radiation that that reach the earth. UV radiation is part of the electromagnetic (light) spectrum that reaches the earth from the sun. It has wavelengths shorter than visible light, making it invisible to the naked eye. These wavelengths are classified as UVA, UVB or UVC, with UVA the longest of the three at 320nm-400nm. UVA is further divided into two wave ranges: UVA I, which measures 340nm-400nm, and UVA II, which extends from 320nm-340nm. UVB ranges from 290nm-320nm. With even shorter rays, most UVC and part of UVB is absorbed by the ozone layer and does not reach the earth. Both UVA and the longer wavelengths of UVB, however, penetrate the atmosphere and play an important role in conditions such as premature skin ageing, eye damage (including cataracts) and skin cancers. The importance of a sunscreen containing both UVB and UVA protection has been well documented over recent years. To obtain complete protection from both UVA and UVB radiation, formulators usually rely on mixing a variety of UV filters. MAAs absorb a range of UVB and UVA radiation, and absorb strongly in the region of their wavelength of maximum absorbance. Despite these promising UV absorbing properties, MAAs have not been successfully utilised as consumer sunscreen ingredients by the cosmetics industry. This is thought to be due to their lack of stability once extracted from the natural source, being particularly prone to dehydration with associated aromatisation and hydrolytic decomposition. Such instability would pose problems for a consumer sunscreen formulation and have severe implications for shelf life. The MAAs also show high levels of water solubility, which could pose problems from a water resistance and, potentially, a skin penetration standpoint. Cosmetics company Larissa Bright Australia recognised the need for a sunscreen that was suitable for sensitive skins, derived from nature and provided broad spectrum coverage that meets Copila ratio in the one molecule. 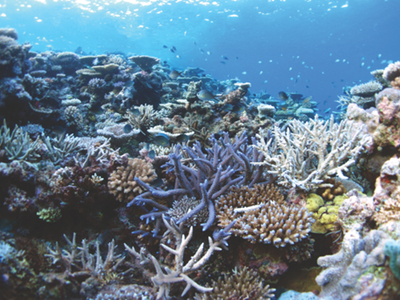 The company partnered with AIMS to secure AIMS’ proprietary intellectual property regarding UV absorbing compounds and with Australia’s premier industrial research institute, CSIRO, to investigate the possibility of creating a series of filters that translated the proven sunscreening ability of corals into molecules with potential to protect the consumer adequately from both UVA and UVB rays. Taking inspiration from the natural sunscreening molecules of the coral reef, scientists at the CSIRO Division of Materials Science and Engineering have developed a range of new filters. These molecules maintained the mechanism of UV protection which the corals have perfected over thousands of years to survive the harsh Australian sun when exposed at low tide. 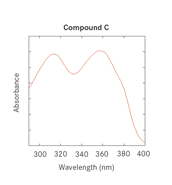 Moreover, the compounds increased the portion of the proportion of the UV spectrum covered. A comprehensive suite of novel marine derived sunscreen agents have been prepared, providing filters which absorb predominantly in the UVB region (figure 2, compound A), the UVA region (figure 3, compound B), and compounds with the potential for broad spectrum UVA/UVB coverage (figure 4, compound C). In striving to provide broad spectrum protection in a single molecule, the researchers at CSIRO and Larissa Bright Australia are aiming to reduce the current need for blending a series of filters to cover the entire UVA/UVB region of the electromagnetic spectrum. The new filters compare favourably with currently available commercial materials. One measure of the strength of a molecule’s ability to absorb light at a given wavelength is the molar extinction coefficient, or molar absorption coefficent (ε). The higher this value, the stronger the absorption. Commercial filters typically have ε values ranging from less than 10,000 up to approximately 30,000 while the marine derived filters possess ε values typically around or greater than 20,000. The development of sunscreens offering broad spectrum protection is an area of increasing importance. To be classified as broad spectrum, a sunscreen must have a critical wavelength of greater than 370nm. 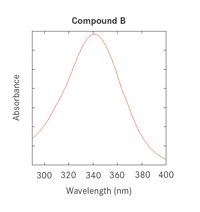 This is defined as the wavelength below which 90% of the absorbance between 290nm-400nm occurs: compound C (figure 4) has a critical wavelength of 375nm. Larissa Bright Australia recognised a market need for a safe, effective, non-irritating sunscreen drawing on nature’s intelligence. Further, the company wanted to develop a new filter that met Copila and new broad spectrum guidelines within one molecule. With the knowledge that Australia is the sun cancer capital of the world, Larissa Bright Australia has invested significantly to research and develop nature’s sunscreen for human application. The filters are expected to be received with optimism in all markets, especially fast growing markets such as Latin America and the Asia Pacific, where there is a growing consumer awareness and desire for naturally derived sun care and formulations suitable for sensitive skins. The unique selling position – being derived from corals on Australia’s Great Barrier Reef – is expected to enhance the filters’ popularity globally. Just as the high UV filtering efficiency of these molecules makes them of potential use for sunscreen/cosmetic applications, Larissa Bright Australia and CSIRO see much potential for developing the molecules for a range of applications including the photoprotection of materials. The UV filter series is patent pending and Larissa Bright Australia and CSIRO are continuing to develop the molecules and explore further applications. K. Shibata, Plant Cell Physiol. 1969, 10, 325. W. C. Dunlap, B. E. Chalker, Coral Reefs 1986, 5, 155. W. C. Dunlap, B. E. Chalker, W. M. Bandaranayake, J. J. Wu Won, Int. J. Cosmetic Sci. 1998, 20, 41. R. P. Sinha, Klisch, M., E. W. Helbling, D. P. Hader J. Photochem. Photobiol. B: Biol. 2001, 60, 129. N. A. Shaath, The Encyclopedia of Ultraviolet Filters, 2007, Allured Publishing Corporation, IL, USA.